Hydroponics is a method of gardening that doesn’t use soil, but rather a rich nutrient solution that cycles through from a reservoir. Some systems can get quite complex but for a small urban space the process should be really quite simple. These automated soilless growing systems increase efficiency and maximizing space, leading to higher yields and potentially better quality produce. Microgreens Production by My Yard Farm. Regardless of how elaborate the soilless growing system is, what is most important is the end result: healthier and faster growing plants. Your vegetables may end up tasting better as well because of the rich nutrient and mineral solution that they are grown in. Growing your own microgreens is a new hot trend among urban dwellers and the coolest way to do it is with hydroponic indoor gardening- a soilless growing system. Having a neat little row of basil, kale, and cilantro will make your indoor gardening experience more visually satisfying as well. To build a simple hydroponic system that will be practical for a small urban space, you will need a few common supplies. A tray, a reservoir, a pump, and an air stone are really all you need if you’re keeping it simple. You don’t even need lights, but they are recommended depending on what type of plant is being grown. There are some energy efficient lighting systems you can opt for such as LED grow lights. HomeHydroSystems.com has a clear explanation and step-by-step process for more information about building the system. –The Urban Cultivator is a freestanding unit that looks attractive and is pre-programmable for any plant you choose to grow. This soilless growing system is not available on Amazon but they do have a link on their website that shows where the system is available. –The Aerogarden is perfect for a small urban space. It’s small enough to sit on your counter or table and they come in different colors and styles all of which are aesthetically appealing. The Aerograden is a fully automated and easy to use soilless growing system. You can buy them direct from aerogarden.com. 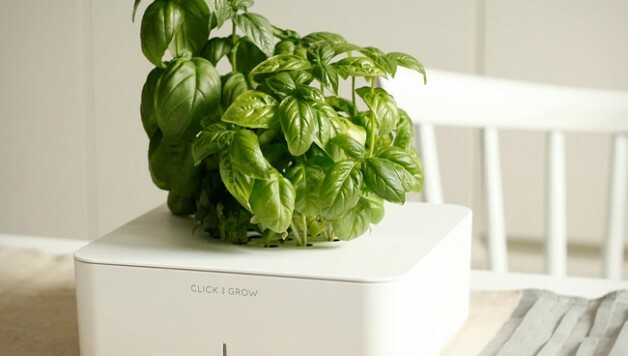 –The Click & Grow system allows you to automatically grow flowers or herbs. You will need to fill the water tank and replace the plant cartridges every so often. But it is a good-looking system and they do sell it on Amazon. If you’re still not sold on the value of hydroponic indoor gardening then I encourage you to check out this TED Talks video by the brilliant Britta Riley. She created an open source project to promote the research-and-develop-it-yourself method of window farming. For more information on her company, Window Farms visit www.windowfarms.com. We also featured this product in our article on Vertical Gardening which is another fabulous way to grow indoors. There are more and more ingenious ways of growing indoors. What are some of the methods you have tried? Did you build them yourself or are there kits available for purchase?